A fantastic vegetarian option, perfect for spring and summer. To make the pastry, sieve the flour and salt into a glass bowl, add the butter and using your fingers crumble together until resembles breadcrumbs. Add the beaten egg yolk and some water until the dough comes together. Wrap in clingfilm and allow to rest in the fridge for 30 minutes. Lightly grease a 12" pastry tray. Roll the pastry into a rectangle, approximately 3mm in thickness. Trim the excess and place in the fridge to rest. Meanwhile melt half the butter in a frying pan and when foaming add the pear and brown sugar, turning once or twice until golden (approx 5 minutes). Transfer to a plate. Add the remaining butter to the pan and add the onions, cook for 2-3 minutes until golden. Remove the pastry from the fridge and cover with some parchment paper, fill with some rice or dried beans. Place in the preheated oven for 15 minutes, remove from the oven and remove the paper and rice or beans. Whisk together the eggs and cream, add some salt and pepper. 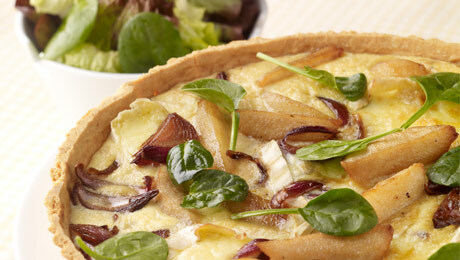 Arrange the caramelised pear, brie and onion over the base of the pastry, then pour over the cream mixture. Bake in the oven for 30 minutes until just set. Remove from the oven and set aside for 5 minutes.